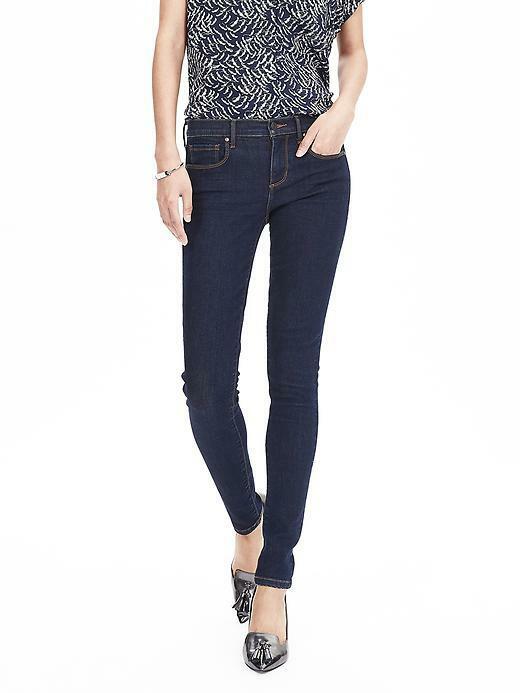 Banana Republic New Premium Denim: Figure transforming fit. Unsurpassed recovery. Body conforming stretch. Zip fly with button closure. Belt loops. Traditional five pocket styling. Our denim is made under strict guidelines to ensure that the water used in washing and dyeing is safe and clean before it is released into the environment. Sits below the waist. Slim through the hip and thigh. Narrow leg opening. Inseams: Petite/Short: 26"; Regular: 28"; Long/Tall: 31" Sizing: 2400, 250, 262, 274, 286, 298, 3010, 3112, 3214, 3316. 89% Cotton, 8% Polyester, 3% Spandex.